Stem. - Rough and hairy, one or two feet high, erect, very leafy, branching at the summit, without milky juice. Leaves. - Linear to narrowly lance-shaped. Flo7vers. - Bright orange-red, in flat - topped, terminal clusters, otherwise closely resembling those of the common milkweed (p. 192.) Fruit. - Two hoary erect pods, one of them often stunted. Few if any of our native plants add more to the beauty of the midsummer landscape than the milkweeds, and of this family no member is more satisfying to the color-craving eye than the gorgeous butterfly-weed, whose vivid flower-clusters flame from the dry sandy meadows with such luxuriance of growth as to seem almost tropical. Even in the tropics one hardly sees anything more brilliant than the great masses of color made by these flowers along some of our New England railways in July, while farther south they are said to grow even more profusely. 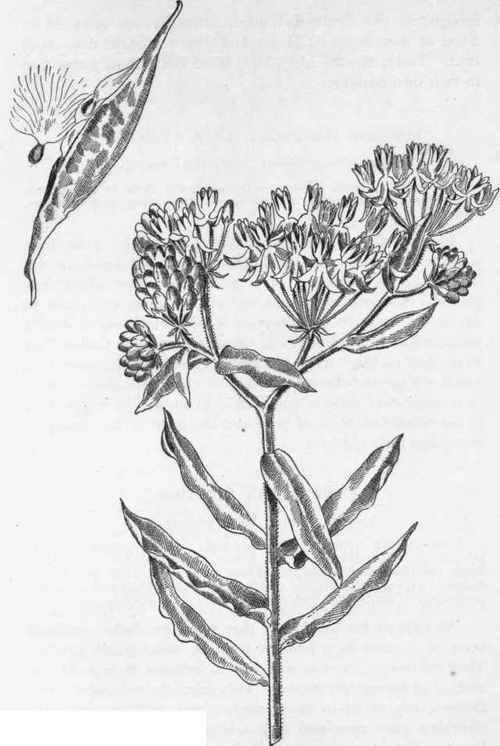 Its gay coloring has given the plant its name of butterfly-weed, while that of pleurisy-root arose from the belief that the thick, deep root was a remedy for pleurisy. The Indians used it as food and prepared a crude sugar from the flowers; the young seed-pods they boiled and ate with buffalo-meat. The plant is worthy of cultivation and is easily transplanted, as the fleshy roots when broken in pieces form new plants. Oddly enough, at the Centennial much attention was attracted by a bed of these beautiful plants which were brought from Holland. Truly, flowers like prophets are not without honor save in their own country.